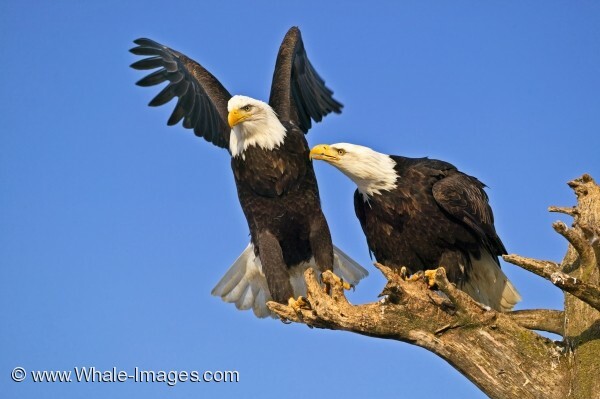 Two bald eagles perched upon a bare tree in Homer, Alaska in the United States. One of the Bald Eagles is ready for take off after discussing life with his friend in Homer, Alaska in the USA. Whether a bit of a spat is happening between these two bald eagles or their strategy for the next meal is underway, they both seem to be ready to take action in their plan of attack. These exquisite types of birds are a very important symbol throughout the United States and have become an inspiration to the world of art, music and architecture. A highly respected bird amongst humans and definitely considered a threat to some bird family species. Approximately twenty years ago there was only about five Bald Eagles soaring the sky of Homer, Alaska but now there is a daily average in the winter of about one hundred and fifty. Some of the local residents of Homer, Alaska are finding the eagles to be a problem due to the high numbers but the majority still find the Bald Eagle a vision of beauty. Homer, Alaska is an excellent place to view hundreds of Bald Eagles perching atop trees, soaring the sky or diving for their next meal. A place that is famous around the world for these majestic birds and winter seems to be the season when the Bald Eagles unite here.